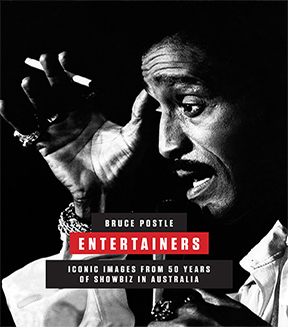 Entertainers presents around 150 of Bruce Postle’s greatest images capturing the local and international acts that have lit up Australian showbiz for half a century. It is a showcase of artistic achievement, featuring the likes of Bill Haley and the Comets in Brisbane in 1957, the ever-enduring Stones on their first visit down under, and a treasure trove of home-grown talent from the Delltones and Johnny O’Keefe to Tina Arena and Keith Urban. In the realm of musical theatre there are world-renowned stars such as Marina Prior and Anthony Warlow. Entertainers is the third in a series from Bruce Postle, celebrating unique aspects of Australian life. Future titles will include At The Track, Politics, Australiana, Weather and Cricket.